A story picked up by several news outlets, including Reuters and ABC News (whose version I’m critiquing in this post), reports results of a small study published in the Journal of the American Medical Association that suggest autistic children have heavier brains and an overflow of brain cells called neurons. The study is crucial because it presents the first exhibit of hard evidence of brain development veering off course for autistic children. Previous research showed that autistic children have larger heads and brains, with key regions that develop communication overgrown. The study, using brains of 13 boys that were donated for scientific study after their deaths, discovered that brains of autistic children have 67 percent more neurons in the prefrontal cortex than non-autistic brains. The prefrontal cortex is linked to emotional, social and communication processing. The study’s lead author notes how surprising the finding was, also suggesting the abnormal development occurs in the prenatal stages as neurons aren’t generated in the prefrontal cortex after birth. Autistic brains also weighed 17.5 percent more than non-autistic brains. While a future avenue could be explored in the research to find a cause, many point out the findings are preliminary and don’t apply to children and families currently dealing with autism. There is also no way to analyze brain tissue of living children. The small sample size and lack of immediate impact may discourage some readers upon encountering this story. However, the findings are notable with several major outlets offering their version of the results published in the Journal of the American Medical Association. Although not new, the story does reveal through autism brain research that a physical characteristic that could possibly signal the condition exists, but not every person with a larger-than-average head will automatically develop the disability. As with most study findings, extrapolating the results to a form that fits mainstream journalism remains simple, yet difficult. When combining the small number of brains studied with the lack of any immediate significance for the autism community, the challenge for reporters is seeking a relevant development for a scientific breakthrough. In this case, Gann points out that discovering that an abnormal development occurs before birth could lead to improved screening efforts in the future. Another possible avenue that could be investigated with the knowledge of this study are what effects larger, heavier brains with more neurons could have on autistic people. Several stories on this blog and general knowledge will highlight the untapped gifts of the autism spectrum, including superior memory skills and focus. This is by no means a suggestion that larger brains equal smarter people, but considering the astonishment from the public when autistic people demonstrate skills with general knowledge, but a plethora of stories relating to autism and the brain could be found should this study lead to more examinations. For now, we’ll have to settle for current methods of diagnosis as science always approaches its studies with a methodical attitude. CNN picked up a story originally published by Health.com reporting that a new study may help detect autism in children as young as 1. The study is a 24-item questionnaire that assesses a child’s ability to communicate via eye contact, sounds and gestures. 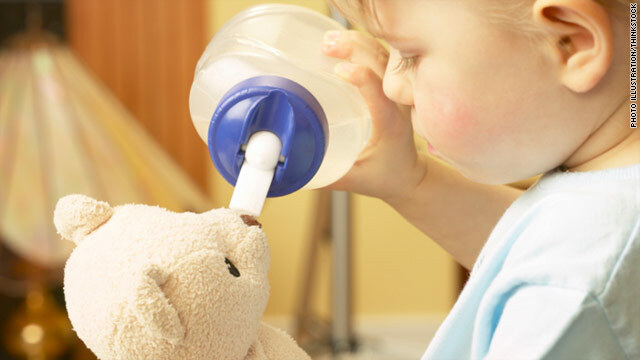 Warning signs could then be noted, allowing children to receive treatment earlier than current models. The Health.com story lists the average age for a diagnosis at five years old. Although the lack of biological signs for autism can make diagnosing the disability tricky, the questionnaire takes five minutes to fill out and can be scored on the spot. The checklist doesn’t identify autism spectrum disorder specifically, but will tell takers something is wrong, which may point to autism or another developmental delay. In the study, where 137 pediatricians in the San Diego area screened over 10,000 children, only 32 of the 184 children whose development was below normal were diagnosed with autism. However, 56 were diagnosed with a learning disorder and 9 had another disorder entirely. Overall, the questionnaire’s accuracy level from the study’s data pool was 75 percent. While the questionnaire doesn’t add the long-awaited biological marker everyone in the autism community, the questionnaire showcased its potential with detecting delays in developmental skills. Although the accuracy rating may make some parents squirm, there may be some satisfaction with its versatility, especially when virtually all medical professionals stress intervention as early as possible. One reason for the accuracy rating may simply be who they screen. Infants and toddlers are far from developing their abilities with motor and communication skills, as opposed to five-year-olds, where deficiencies are easier to detect. Scientific and anecdotal evidence suggest symptoms of autism aren’t clear until a child reaches 18 months of age. While the screening doesn’t specifically evaluate infants under that age, there’s a risk from parents or caregivers making too much out of the questionnaire’s findings and preparing for a disability whose presence can’t be officially identified that early. The story itself focused on the study’s findings, how they were procured, and its potential for widespread use. Unfortunately, without an author, gauging who contributed to the story is virtually impossible. Most stories will indicate if more than one writer published the article, but stories themselves aren’t structured in different formats when written by a host of writers. The structure of journalism doesn’t change for television, newspaper or magazine writing. Even if writers have a unique approach to writing a story, the editing process will streamline the final version. Developments on this questionnaire will unfold over time, but the community will eat up almost anything that may give them an edge, even if a wild goose chase ensues. My journey to find a news story that would cover the perils of wandering drew parallels with the 1961 Dion hit of the same name. Unfortunately for parents, autistic kids who go “around, around, around” aren’t doing so to impress females. A study conducted by the Interactive Autism Network, using a national survey of 856 parents of autistic children, revealed around half of them wandered off at least once, sometimes gone long enough to cause alarm. Two-thirds of surveyors said their children had a “close call” with traffic while one-third said a child nearly drowned. A 58 percent majority cited wandering as the most stressful behavior displayed by an autistic child. Delthia Ricks of Indiana newspaper The Republic interviewed a doctor who wasn’t involved with the survey but has communicated with families whose autistic kids elope. The study listed no primary reason for eloping as that wasn’t the study’s focus, but the story mentions “wanderlust,” avoidance or a specific destination as theories for taking off. Wandering can continue through adulthood, although the odds drop as children age. The biggest concern with autistics eloping is their lack of social awareness, including stranger-danger, increasing their vulnerability to harmful elements. I detailed such a case of wandering in my third autism documentary, but the mystery was solved long before a major panic ensued. Most stories on studies hash out the numbers while adding quotes from a source on a press release or in a separately-conducted interview before validating those numbers in a follow-up story should a journalist take that action. For an autism community member, these findings may allow them to cite scientific evidence instead of anecdotal references, but the story is hardly surprising since wandering is a publicly-known issue. The focus of an autistic child is sometimes intense, to the point where they close off other forms of stimuli until the child’s task is complete. Drama can exponentially rise if a wandering child is non-verbal, reducing the likelihood of responding to audible signals. The news environment itself adds a dramatic dash, with their preference to hype stories of danger, despair and fear of an unknown future to boost ratings and theatrics. The last two paragraphs of Ricks’ story fit with the overall theme without fabricating autism’s hazards, but when parents are exposed to this story, combined with other risks of childhood (which include eloping from non-autistic kids), the chances of buying the media’s perspective of the world is higher, even though stranger-danger is statistically less of a risk than harm from a known acquaintance. Autism can nullify the odds, but this story is a worthwhile lesson to absorb content presented to us without reacting impulsively. Knowledge of autistic people eloping is common among the community, the wild card may be people who aren’t exposed to autism regularly. Don’t be surprised if Ricks or another reporter spells out the numbers through a story of experience with a family or caregiver watching an autistic child. Monitoring “child-proofing” stories for an expose on preventing autistic children from bolting may also prove fruitful in the short-term, as child safety is a frequently covered topic in news. The information was public for some time through Google searches, but until The Republic picked up the story, all I could find were press releases. While PR does contain journalistic elements, they generally don’t follow the same format as professional journalists, and the purpose of this blog is detailing and dissecting mainstream news coverage of autism. Occasionally, I’ll post coverage outside of traditional newspapers and TV stations, but my theme will not bend from analyzing how mainstream media presents news and information on the topic of autism, which is why some time elapse before I got to this story. 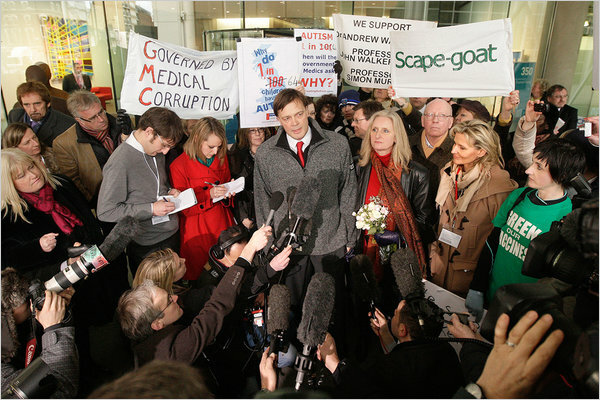 The start to the 2011 calendar year was rocky for Andrew Wakefield, whose study was declared false by British journalist Brian Deer, who published several stories in the British Medical Journal highlighting Wakefield’s alleged false claims and unethical practices. Deer compared Wakefield, who lost his medical license after his study linking M.M.R. vaccines to autism was retracted last year from the medical journal Lancet, to a religious leader who occasionally uses the smoke and mirrors technique to goose the faith of his followers. Deer’s investigation was one of many facets spilled out in an article by Susan Dominus for The New York Times Magazine, a longhand form of the country’s most recognizable newspaper. As with any form of magazine writing, the stories take on the form of novels and are more descriptive, too descriptive for me to summarize in shorthand form. That’s no reason to turn away though, as Dominus provides an insight on Wakefield no American reporter has offered before. Through her journey interviewing and shadowing Wakefield, we learn that Wakefield himself didn’t claim proof that M.M.R. vaccines were causing autism, but that didn’t stop his concerns from spreading worldwide the same way viruses spread through the body until its defense mechanisms can suppress it. If recent media coverage is any indication, Wakefield became one of the most reviled doctors of his generation, receiving blame for starting a panic that led to the resurgence of diseases long squashed by vaccinations. Despite the wave of damning evidence which has led him to close himself professionally, he still draws followers, as 250 attended a discussion he conducted regarding his work. His supporters view him a hero when nearly everyone else paints him as a villain. Wakefield himself believes public health officials and pharmaceutical companies pay bloggers to post vicious material about him. Throughout the story, Dominus compliments Wakefield’s persuasive skills, even when the audience knows better. Wakefield continues to fight and promote his theory, with Dominus adding that the more he has sacrificed (he resigned from London’s Royal Free Hospital following his publicized concerns and now lives in Austin, Texas), the more he must believe in his theory, or all efforts will be rendered useless. Ironically, medical experts suggest aggressive studying of the M.M.R. vaccine following Wakefield’s 1998 media splash means the vaccine is one factor than can be ruled out in a disability still shrouded by mystery. Dominus assures the readers that she isn’t necessarily siding in Wakefield’s camp, but she does give him an opportunity to present his case as other reporters who interview Wakefield quickly write him off as a discredited liar. By not falling into the dramatic trap that can detract storytelling from other outlets, readers of this story see why Wakefield continues his battle for reputation with his supporters waiting in the wings to back him up. We even learn a few personal anecdotes about his life before gaining his notorious status in Great Britain and most of the United States. In order to obtain the behaviors, characteristics and traits Dominus lists regarding Wakefield, interviewing goes well beyond the simple press conference or brief one-on-one interview. Traveling with the source and immersing in the source’s comfort zone is common, and more relationship skills are needed to ensure you get the story requested in your assignment. In the case of Wakefield, encountering Dominus and her approach may have been more comforting since she offered a value other reporters decided to box away, even though she was no less neutral than shorthand writers covering the Wakefield saga. Ultimately, Dominus reveals the basis of Wakefield’s support comes from parents seeking answers who credit him or his associates for trying a possible solution, even if the strategy is cautioned by others (including casein and gluten-free diets, a media craze for a short time). Magazine-style writing allows writers like Dominus to include more details and examine many subtopics of a story that traditional news articles can’t provide because of space or time constraints. Her observations may not remove Wakefield’s “villainous figure” in the eyes of the medical community, but just as the Marvel Comics movies emphasize human elements within their villains, Dominus’ story leaves Wakefield less clear-cut than previous mainstream glimpses portrayed him. A new study published in the May issue of Epilepsia shines more light on the link between autism and epilepsy. The findings were picked up by multiple media outlets, including WebMD and U.S. News and World Report, where health reporter Jenifer Goodwin once again broke down the results. 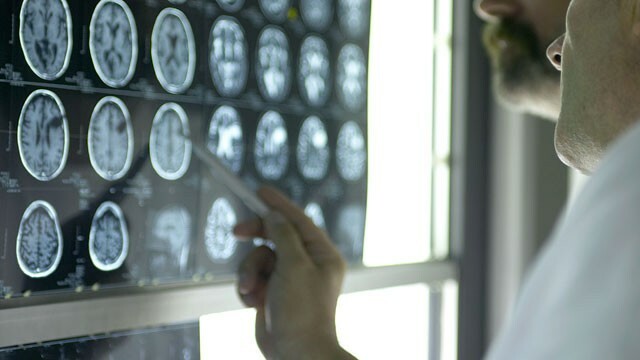 Researchers who looked at records of 127 patients aged 3 to 49 who were autistic and had at least one seizure over a 20-year period at the NYU Comprehensive Epilepsy Center in New York City. They found 34 percent of those patients had treatment-resistant epilepsy, meaning seizures continued despite taking medication. 28 percent were seizure-free after treatment and the remaining 38 percent could not be categorized because there wasn’t enough information to determine if their seizures were treatment-resistant or not. The average age of the first seizure in treatment-resistant epileptics was also significantly younger than those whose seizures were treatable (6 for TRE patients versus 11 for patients without TRE). Autistic TRE patients were also more likely to suffer impairments from autism spectrum disorder, as 54 percent of TRE patients had motor skills delays versus 35 percent for those with treatable epilepsy. Autistics with TRE were also more likely to experience developmental regression, which is sometimes noted among parents or other observers following their autistic children. The study’s author, Dr. Orrin Devinsky of the NYU Langone School of Medicine and director of the NYU Comprehensive Epilepsy Center, suggested autistic children may need screening for epilepsy in order to learn more about the connection between the two conditions. Goodwin has been busy making sense out of study numbers the last couple days. Unlike her last story about a survey of parents on vaccinations and their trust with different sources, Goodwin uses more figures in the autism/epilepsy study to highlight patterns suggesting epilepsy may be more common and severe when it targets autistic people. For those of you wondering why the study sample is small, recall that autism itself is still statistically rare and some people who may be on the spectrum may not have an official diagnosis. Likewise, the number of epileptics in the world is less than one percent, meaning the statistical odds of encountering an autistic with epilepsy are slim. The results of Devinsky’s study will likely spur more investigations on the link between epilepsy and autism if none weren’t already underway, paving the way for more insights on autism and epilepsy or perhaps presenting other information that may not agree with the study Goodwin reports about. Remember the inverted pyramid I’ve been talking about for the last few posts? It’s hard to miss in this story, with the first piece of data highlighting the percentage of autistics with TRE, then going into other data relating to autism spectrum disorder, then tying the study with the Journal of Child Neurology publication suggesting epilepsy is more prevalent with autistics than previously thought. She does grab a few quotes from Devinsky, the study’s author, but most of the story spells out the study results. That technique is common with stories on studies as reporters follow their deadlines and, depending on the location or mission plan of the news organization involved, finding the human interest source is hard to find with the low odds of a person diagnosed with both autism and epilepsy. I’m not an epileptic, but I have read about autistic children and adults suffering from seizures in my observation of autism articles and videos. Neither autism or epilepsy may be curable, and the study only begins to excavate a relatively unexplored area of the autism spectrum. With autistics already facing prospects of sensory overload on a daily basis, making the leap to seizures isn’t a stretch. Seeing more stories linking autism and epilepsy should be expected in future media coverage, but knowing when more reports will file in will be a harder task. I’m sure plenty of you are wondering what happened to this site’s activity. To summarize, my schedule was eaten up by a swarm of Minnesota state tournament coverage, but I’ve now returned from my hiatus to continue informing you of autism’s role in the news. I appreciate the visits you’ve made in my three months away from The Autistic Journalist, which passed 10,000 hits during my pause. To thank you, I’ll pull out an article I had saved to discuss with you. Two months ago, MSNBC reported a study suggesting testosterone could be a culprit in the higher prevalence of autism in males. A similar story was picked up by a CBS TV affiliate in Green Bay, but that story has since been removed. The study found testosterone lowers the ability for cells to express a particular gene known as RORA. That gene, when activated, can protect neurons from the effects of stress and inflammation, and both are elevated in autistic people. Conversely, estrogen raises RORA levels, which may protect females against autism even if RORA levels were otherwise low. An alternate theory is genes in the X chromosome, suggesting females have a “backup copy” since they carry two X chromosomes while males have one X and one Y chromosome. Despite the theory’s plausibility, no X chromosome genes have been associated with autism. This doesn’t mean your boys will develop autism upon reaching puberty, when testosterone increases can be noticed. The story gives us a potential clue to autism’s cause, but genes and testosterone levels are simply a game of chance when cells are developing. The explanations provided in the story make sense, but more research will be needed to make an accurate conclusion to this hypothesis. While the story doesn’t say much, people have been wondering why boys are more likely to receive an autism diagnosis than girls, and any step that brings an answer closer to a question may help ease the mind of concerned individuals.